Puppies are given a wonderful start here in our home, we are proud to use Early Neurological Stimulation/Superdog techniques to give you a well rounded puppy that will thrive with your family after leaving Shelby Avenue. A quick note about deposits - Please be aware that I am consistently in contact with dozens of people inquiring about puppies. There is a good chance I am emailing with several families about the puppy you are interested in. Please understand that until I receive a deposit, I can not hold a puppy for you. I also can not hold multiple puppies for you to choose from with a paid deposit. 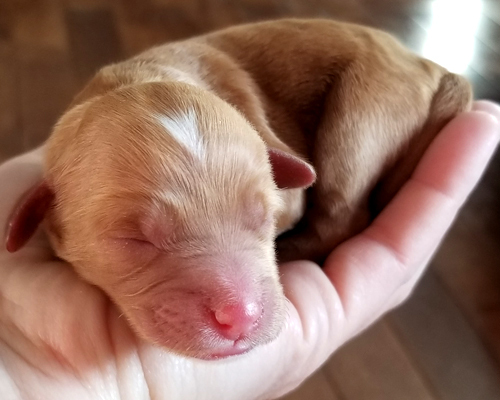 If you are undecided about which puppy you want, someone else has the opportunity to purchase any puppy on your list until you make your decision. Please email me if you are interested in adding one of these perfect pooches to your family! Visit this page often? Please refresh to make sure you are viewing up to date information! We took a couple months off from puppies, we will have minis ready in early July, then nothing ready until late August/September. Piper and Obi. Puppies will be red or caramel with white markings. This is a repeat litter and pups were exquisite last time! Due May 11, ready for homes 4th of July weekend! Piper's litter is closed. If there are any puppies available once they are born, I will update this page. If you would like to be added to a notification list in case of availability when the litter is born, please email me. Interested in a Labradoodle but don't want the price tag? If you are within a reasonable driving distance from Fort Dodge, Iowa, contact me about becoming a GUARDIAN HOME for a breeding dog for a lower price than regular puppy pricing. You keep the dog at your home, she comes to me for breeding and whelping of 3-4 litters, then she is spayed and yours forever. I pay all medical costs related to breeding and to complete health testing, you pay for routine vet care. Deposits are $500, with balance due at 5 weeks old. Puppies sold after 4 weeks old must be paid in full at time of sale, unless paying cash at time of pickup has been arranged. Please visit our Pricing/payments page for more info. Please note - all size estimates are just that - estimates. I do not, can not, guarantee the adult size/weight of your puppy. I can tell you the size I expect them to be at maturity based on parents and previous litters. They may end up being slightly larger or smaller than anticipated, but I do feel my expectations of them are pretty accurate. We feed Life's Abundance! A premium food delivered right to your door. Order in advance to be sure you have it on hand when your new puppy comes home!